Wish you a very Happy New Year! Hope 2011 was a great one for you and wish you have an even better year ahead! Do you make any resolutions? Do you break them? I never, never break them!!! I don't make any you see! We are pretty boring folks that way...no new year parties, no fuss, no resolutions. 2011 has been rewarding, have loved and enjoyed blogging, learnt a couple of new things too. A mention and a tiny article in the local edition of the magazine, Time Out Bangalore, made me so happy! Felt truly, truly honored when Deeba Rajpal, India's most famous and best baker-blogger, mentioned my little space as one of her 5 favorite Indian blogs, in her interview with Blogadda! Left yours truly tickled pink and blushing beet red indeed! Being a (part-time) working wife and mother of two, obsessed foodie, baker and blogger, wearing many hats with ease and efficiency, is something I am yet to learn. Sigh! Moving ahead, hope 2012 will bring even better times, good health and happiness, hope to be more organized and do more in a day (only 24 hours and so many things to do!). Daughter starts her dance classes, son wants to take up cricket - it is effort along with academics, for both them and us. But we owe it to our kids - to give them the wings and help discover their interests and potential. Takes some zipping around and how I loathe not being comfortable in the driver's seat! Probably time to practice driving ( yep, I do have my license, but am too chicken!) and hopefully get myself a set of wheels! Long list, I know! But nobody ever said, being parents, and to two kids at that, is easy. Hope to achieve at least some of the above in the near future. We are not much of believers in New Year, Valentine's Day and the kind . Unless it something of personal significance, we think of it as just another day. Well, I told you we are boring! But I always look forward to seeing the date on the calendar. This means schools will reopen after the Christmas vacations. Kids finally out of my hair for some time at least! Relief!! Hubby's birthday is just around the corner. So, a much awaited decorated cake is in the offing - am excited!! My blog anniversary happens to be right after that, have an ongoing event and a giveaway for you. On this happy note, here is a simple loaf cake made with extra virgin olive oil and yogurt, Dorie Greenspan's recipe. 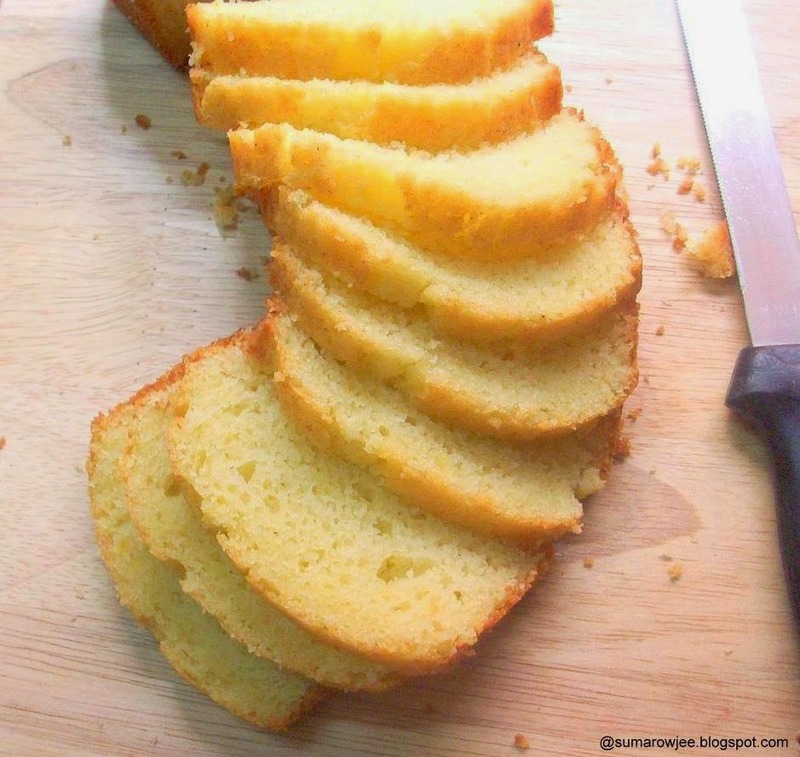 She calls this the simplest loaf cake, needing no more than a whisk and a bowl to put the cake together. I love cakes baked with oil as they are much more moist and much less fuss too. 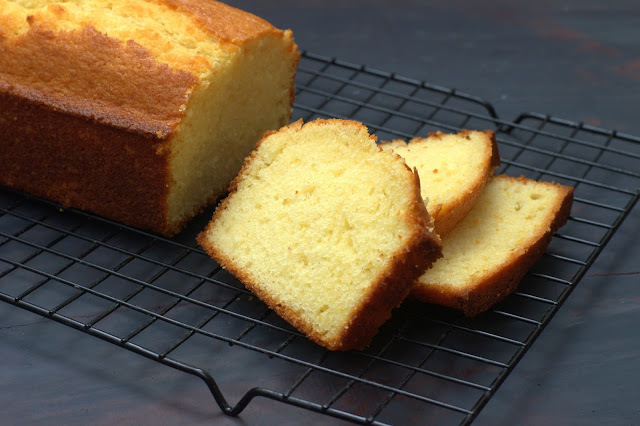 This cake can be made with any neutral oil of course and I tried it with rice bran oil as well, but EVOO lends a distinct flavor and richness to the cake. Yogurt is something most of us have at home at all times, so no extra effort for this. 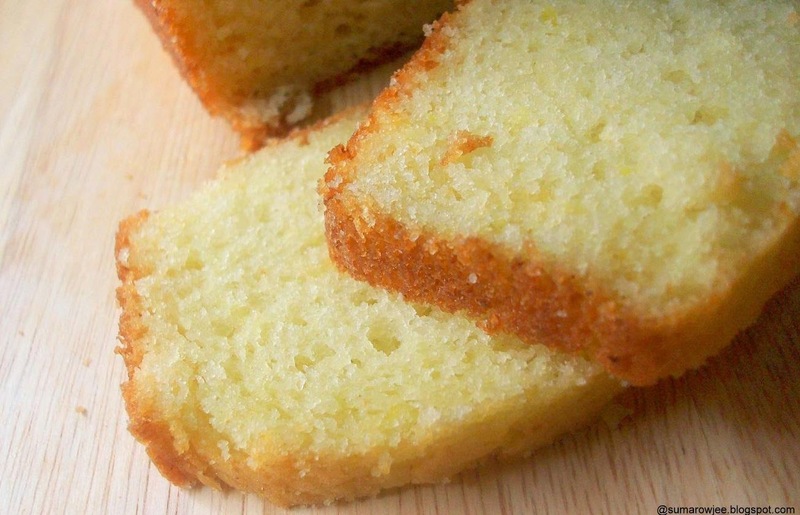 A kind of less rich, but flavorful, healthier version of a pound cake if you please. Just my kind of tea-cake, non-buttery, just about sweet, light, yet tasty, with a refreshing hint of citrus and of course the EVOO. Center a rack in the oven and preheat the oven to 180 degrees C / 350°F. Grease, flour and line a 8 1/2-x-4 1/2-inch loaf pan. I have used a smaller tin, but please stick to the recommended tin size if you have just started to bake. Sift the flour, baking powder and salt, keep aside. In a medium sized bowl, whisk together the yogurt, eggs, sugar and vanilla. (If using fast dissolving fine grained sugar, put the sugar and zest in a medium bowl and rub the ingredients together until the sugar is fragrant, then add other ingredients) Whisk for about a minute. You just want the mixture well blended and homogenous, no need to work up a volume. Gently whisk in the dry ingredients in 2-3 additions. You are more like stirring in the flour with a whisk. Vigorous over mixing /whisking will make the cake tough. The batter needs to be smooth enough with just enough whisking. Use a spatula to scrape any dry flour around the sides back into the batter. Using a spatula, gently fold in the oil. Folding in means incorporating ingredients into a mixture very gently but thoroughly. The batter will be thick and shiny. Scrape it into the pan and smooth the top. Bake the cake for 50 to 55 minutes, or until it is golden and starts to come away from the sides of the pan; a thin wooden skewer inserted into the center of the cake will come out clean. Check at 50 minutes (do not turn the oven off yet), if the skewer doesn't come out clean, bake for 5 minutes more. Thin long wooden skewers work great here, avoid toothpicks. Cool on a rack for 5 minutes, then run a butter knife between the cake and the sides of the pan. Un mold and cool to room temperature right-side up. Slice and serve. Dorie says the cake keeps at room temperature for at least 4 days and can be frozen for up to 2 months. The crumb : The crumb, i.e the inner part of the cake, is what she describes as a coarse one). Different recipes, different techniques, different crumb structure. Yogurt : You could use thick curd with fat percentage of 3% like Nandini, Nestle. If its cold, keep it out on the counter for an hour or so. This will take the chill off it and get it to room temperature. If there is any thin liquid around, just drain (no need to hang it), use only the thick curd. Zest : You could use lemon or orange zest. If you do not have a citrus zester, use a very sharp knife to carefully peel just the outer yellow/ green part of the skin of lime/lemon. Grind it with the sugar. Take care not to scrape the bitter white pith of the lime. Wash the lime/lemon/orange with hot water, pat dry and zest it. This will help wash the wax off. Thanks to all my friends for sending me their entries for my blogiversary event! If you have not yet sent, there is just about a week more left for you to send in your cookies and get a chance to win a copy of Alice Medrich's Chewy, Gooey, Crispy, Crunchy Melt-In-The-Mouth Cookies . Lovely looking loaf ! I am totally with u on the new year and valentine celebration thing...It might be boring, but at least you are not pressurised to celebrate the day because everyone does ! Happy new year n esp for ur kids.. super soft and yummy cake.. This cake looks super soft and delicious and because of the olive oil it must be much lighter and healthier than the buttery ones.. Your cake looks absolutely wonderful, such soft and moist texture, I have book marked it for trying. will let you know. I am the same with celebration of days and for me any day is good for making resolutions (or breaking them), I don't wait for the Year to start you see..Here is wishing you and yours a Happy, Healthy and successful 2012! I am a new blogger, recently started my food blog. Such a soft and fluffy cake. looks so fluffy & moist.. never baked a cake with olive oil. sounds interesting, but do u get olive oil taste when u bite into the cake? Looks super soft! Happy New Year! Super spongy and wonderful looking cake,lovely.. Your new year write up could be mine, except--I am not so accomplished, so efficient and such a great baker. Well, I guess, only the boring folks part is common to us. You deserve every bit of praise that has come your way in Timeout. So accomplished ans so humble-very hard-to-find trait these days. happy New year, Happy Blogging Year to you dear. Hoping to meet up sometime this year. And I forgot to ask-would the recipe work if I were to substitute flax seed powder for the eggs? If yes, would using an electric mixer help to fluff up and aerate the batter? I just happened to visit your blogspot via some links and found this lovely looking cake. I couldn't resist and tried it immediately. The cake loaf came out really well. The texture was just great. Also the cake felt light and fluffy. It was a super hit at home. :) Thanks a lot! Just baked this Suma!! Came out great with a nice texture :) Thank you!! Hi Suma....baked this cake today and it came out really well.thanks.